MÜNSTER - Description nouvelle d'Europe. MÜNSTER, S. - Description nouvelle d'Europe. Description nouvelle d'Europe. - MÜNSTER, S.
Title : Description nouvelle d'Europe.. Size : 10.6 x 13.3 inches. / 27.0 x 33.9 cm. 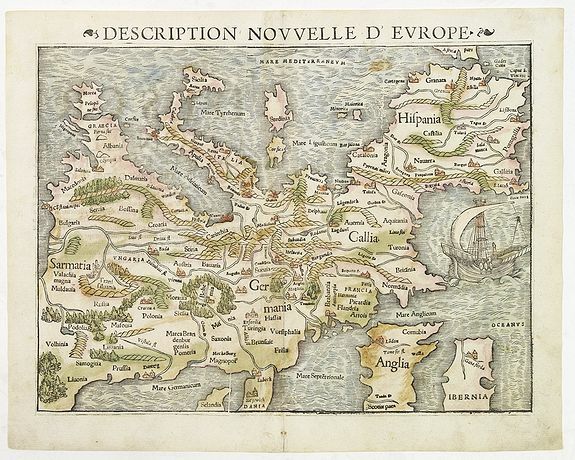 Description :Sebastian Münster's (1488–1552) modern map of Europe from a French text edition. Sebastian Münster (Ingelheim, c.1489-1552, Basel), originally a Franciscan friar, became a Protestant and taught theology and Hebrew at Heidelberg and, from 1529, at Basel. In 1534-5 he edited the first complete version of the Hebrew Bible (2 vols.) to appear by a German scholar. Condition : Wood block print in original colours. Repair of a marginal split along lower center fold.